With the centenary of this documents’ release fast approaching, the last few words seem to glare most menacingly than they otherwise would. “…it being clearly understood that nothing shall be done which may prejudice the civil and religious rights of existing non-Jewish communities in Palestine, or the rights and political status enjoyed by Jews in any other country.” A colossal failure on both accounts. With nearly a hundred years behind us, most of the world has come to see what Torah giants of the time already knew. When the current Earl of Balfour, Roderick Balfour, recently wrote a letter to the editor of the New York Times, decrying the unceasing expansion of West Bank settlements as a primary cause of Anti-Semitism through the globe, True Torah Jews read the letter with no small measure of satisfaction. At least the present Earl would not repeat the mistakes of his predecessor. “Modern-day antisemites, unlike their forbearers, need to find excuses for their hatred, and anti-Zionism has become the excuse du jour. It’s more than slightly unsettling that an accomplished faculty member of one of the world’s most prestigious academic institutions would fail to see the fundamental difference between the above mentioned countries and “Israel”. When Russian president Vladimir Putin invaded the Crimea there was no talk of his being a universal premier of all peoples of Russian descent. Those Russians living in Brighton Beach, Brooklyn, be they immigrants or American born, are not under the illusion that those in the Kremlin represent them in any way, shape or form. Neither is Putin under any such illusion. They live in America and therefore fall under the representation of their local, state and national representatives. Their country of origin no longer has any claims (if it ever did) to their allegiance. The same holds true of those of Chinese or Turkish extraction or whatever other national group one can conjure up. There is only one country presently which has the audacity to speak in such a manner. When Israeli Prime Minister Benjamin Netanyahu stood up for his third speech at a joint session of Congress in March, 2015 and proceeded to declare that he speaks in the name of Jews throughout the world, he was essentially declaring himself our Supreme Leader (G-d forbid). It was an attempted power grab so vulgar and lacking in finesse that it would make even Idi Amin cringe. However, in this case Prime Minister Netanyahu was grabbing for the soul of an entire people. No one could accuse Netanyahu of originality however. He was simply slogging along on a well worn mud path. Theodor Herzl, both in the public and private spheres, proudly advertised the Zionist Organization as the official LEGAL representative of the entire Jewish People. He based this claim on the Roman principle of negotiorum gestio, which says that when the property of a person is in danger and the owner of said property isn’t present to save it, anyone who volunteers may step in and become its legal manager for the sake of its salvation. Herzl claimed that since the Jews were in danger and, according to him, had no one to take care of them, he and his friends would step in as legal guardians of the entire Jewish People. This is the essential distinction which Professor Dershowitz, widely considered “Israel’s” top academic apologist, failed to see and/or mention. Such ethical blindness is unfortunately the privilege of the Zionist intelligentsia which, honestly, borders on the criminal. 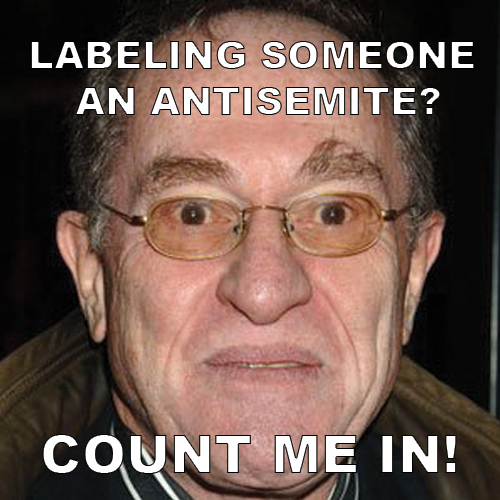 Dr. Dershowitz continued his article by setting forth this theory. The facts speak otherwise. The dramatic uptick in Anti-Semitic attacks and rhetoric during the “Israel’s” 2014 war in Gaza, Operation Protective Edge, would be ample enough evidence for those wishing to prove beyond a reasonable doubt that a rise in Anti-Semitism does somehow correlate with “Israel’s” military endeavors. Tel Aviv University’s Kantor Center for The Study of Contemporary European Jewry documented that Anti-Semitic attacks throughout the world decreased approximately 46% in 2015 versus 2014. The primary cause? There wasn’t a military confrontation between “Israel” and its neighbors during 2015. Though True Torah Jews counts no mathematicians among its staff, the arithmetic is straightforward even for laymen such as ourselves. Roderick Balfour’s letter comes as a breath of fresh air for those tired of the stifling rhetoric of the Zionist State. True Torah Jews wishes to make abundantly clear that traditional Jews have no connection with the State of “Israel” and that observant Jews throughout history have dissociated themselves from Zionism in all its unscrupulous forms from its felonious inception. The facts speak for themselves and as California senator Diane Feinstein stated in 2015 in the wake of Benjamin Netanyahu’s “I represent the Jews” speech, he and others are “arrogant” for presuming to speak in the name of any Jew. Perhaps, but one wonders whether Arthur James Balfour, in his quest to establish a Jewish homeland, was not motivated by Anti-Semitism. We will leave you with these excerpts from the diary of “Israel’s” first president, Chaim Weizmann, in a letter to Ahad Ha’am.